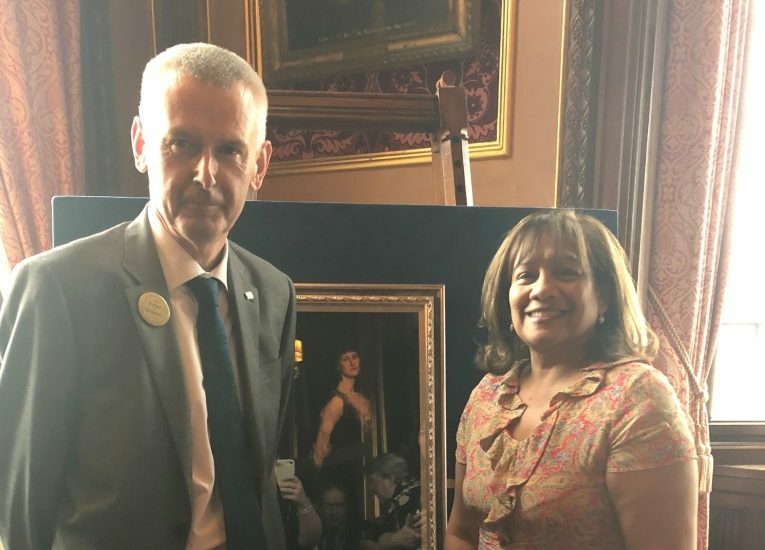 I attended an event in Speaker’s House on 18 July 2018 where a picture of Constance Markievicz, the first woman elected to the House of Commons, was gifted to the UK Parliament by the Irish Parliament (Houses of the Oireachtas). The picture, a reproduction of a 1901 oil painting of Markievicz owned by Dublin City Gallery The Hugh Lane, will be on display in Parliament’s landmark ‘Voice and Vote’ exhibition until 6 October. It will then be transferred to Portcullis House. This gift is just one of the ways in which the UK Parliament and the Houses of the Oireachtas are marking the centenary of the Representation of the People Act 1918. In the December 1918 General Election 8.4 million British and Irish women were eligible to vote for the first time. 17 women also stood for election. Constance Markievicz, standing for Dublin St Patrick’s division, was the only women to be elected. As a member of Sinn Féin, Markievicz did not take her seat in the House of Commons. After the creation of the Irish Free State, she became a dedicated parliamentarian in the Dáil Éireann and was appointed Secretary for Labour – making her the first woman to hold a ministerial position in Western Europe.